A 37-year-old male, known case of hepatocellular carcinoma presented with mild upper backache was referred to the Department of Nuclear Medicine for bone scan. 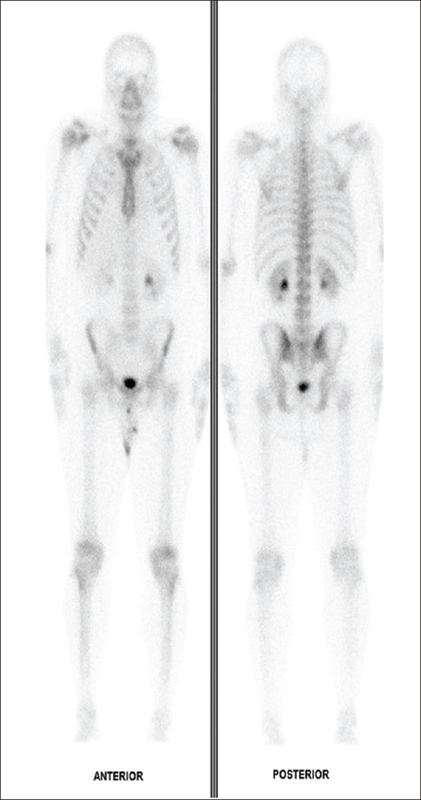 Bone scintigraphy using Tc-99m methylene diphosphonate (MDP) was performed including single-photon emission computed tomography (SPECT-CT). A small rounded photopenic area was seen in the sternal body. The possibility of an osteolytic lesion or an anatomic variation was considered, and noncontrast CT scan of the involved region was performed. 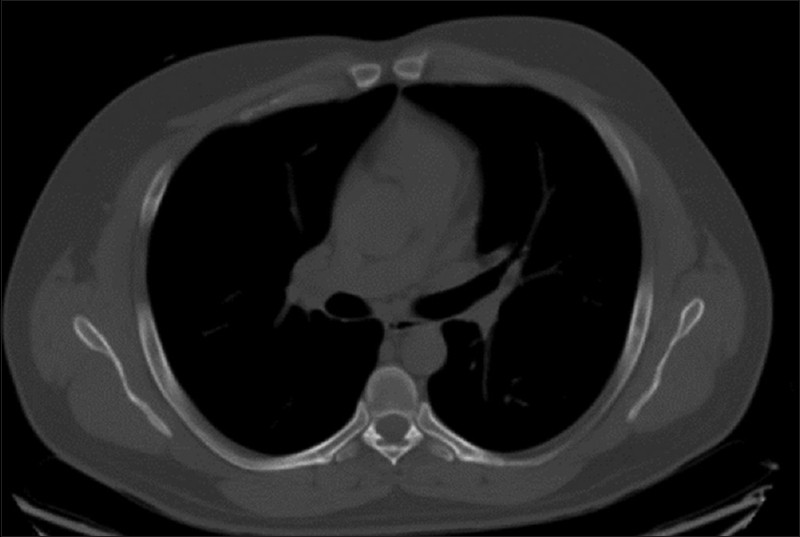 CT confirmed the presence of a large bony defect at the level of the sternal body. Knowledge of the existence of such anatomic variants is important to avoid misdiagnosis as an osteolytic process. The possibility of a sternal foramen should be mentioned to the clinician because infiltration, biopsy, or acupuncture of this area may lead to fatal cardiac complications. A 37-year-old male, known case of hepatocellular carcinoma, post liver resection on follow-up visits complained of upper backache and pain in small joints of hand and feet. He was referred to the Department of Nuclear Medicine for Tc-99m MDP bone scan. Physical examination was unremarkable, and no focal tender area could be elicited. Whole-body bone scintigraphy was performed (Infinia Hawkeye with SPECT-CT). 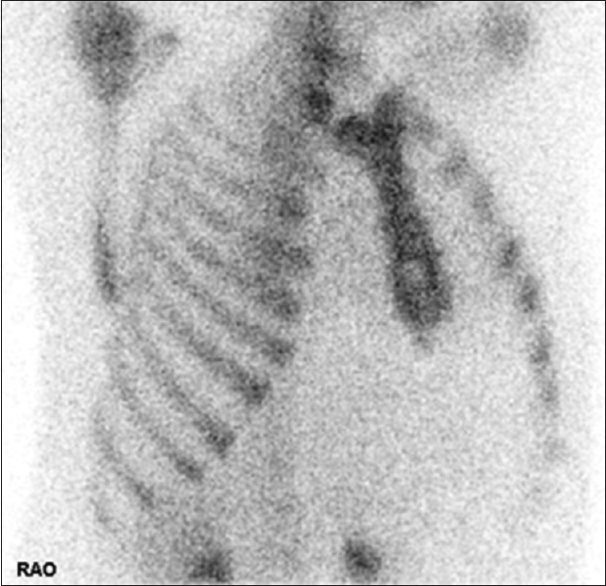 Scan showed rounded area of photopenia in the sternal body [Figure 1] and [Figure 2]. 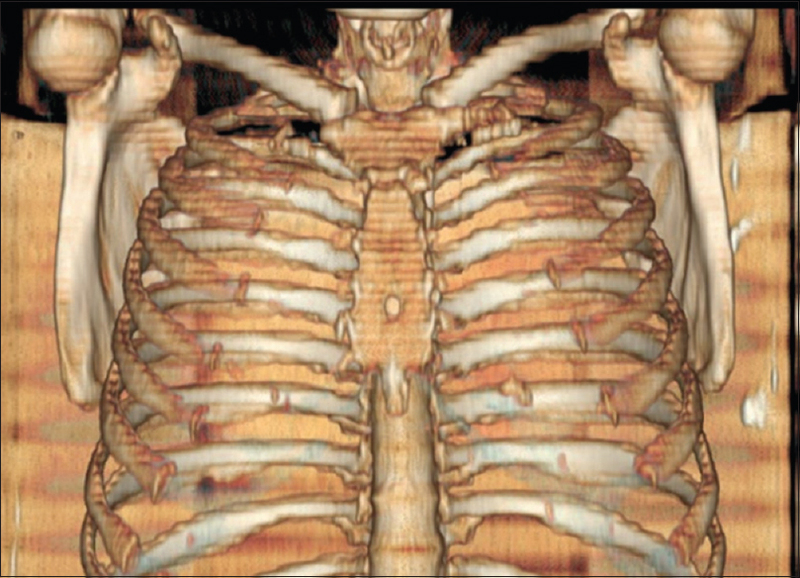 CT scan was done which showed defect in the sternum in lower one-third [Figure 3] and [Figure 4]. Volume rendered images clearly show sternal foramina [Figure 5]. The differential diagnosis of such a lesion consists of an osteolytic lesion, superposition of a necklace, or a congenital variation. 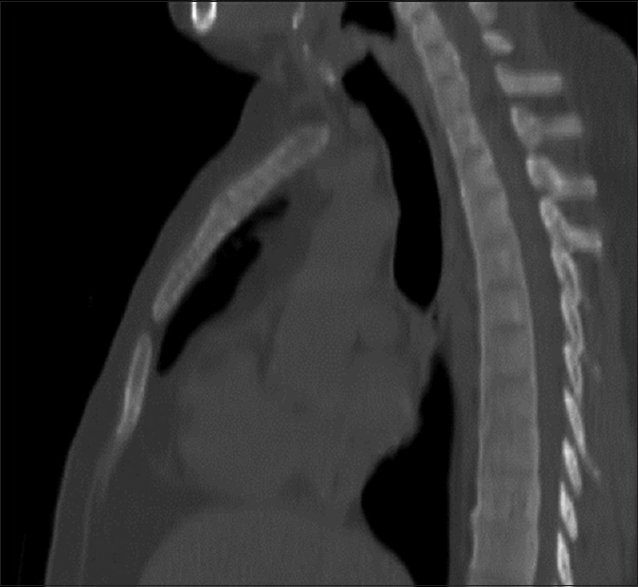 CT scan of the sternum was performed, showing a midline circular defect of the sternal body-sternal foramen. Thus while reporting oncology bone scans, it should be noted that photopenic defects might attribute to congenital variations also, not just osteolytic lesions. The embryologic development of the sternum starts from a pair of a long linear cluster of mesenchymal cells on each side of the midline. These structures convert into precartilage and fuse at the midline in a cephalocaudal direction. The cartilage matures as sternum after undergoing multiple transverse divisions into a series of cartilaginous segments, called sternebrae. The ossification nuclei form in the centers of the separate cartilages, and it is not uncommon for these to be paired in all or some of the sternebrae. The failure of fusion will result in cleft sternum or sternal foramen. The location of it is usually in the lower portion of the sternal body  and are solitary in most of the cases. Variants such as multiple mesosternal foramina and a manubrial foramen also have been described. In fact, size and appearance of the cleft or foramen may show considerable variation. Sternal foramen is asymptomatic, and it is unlikely to cause pain, although few data in the literature address this possibility. Tc-99m bone scan was very important to prevent useless biopsy in the case. The clinical importance is defect being potential hazard when a puncture is performed in this region. Unfortunately, some cases of fatal cardiac tamponade have been reported after needle insertion at the level of the sternum. The differential diagnosis of this type of abnormality includes osteolytic lesion, superposition by metallic pendant or other material, and sternal foramen. In summary, a sternal foramen as demonstrated on scintigraphy may erroneously suggest the presence of an osteolytic lesion. Resnik CS, Brower AC. Midline circular defect of the sternum. Radiology 1979;130:657.
Cooper PD, Stewart JH, McCormick WF. Development and morphology of the sternal foramen. Am J Forensic Med Pathol 1988;9:342-7. Stark P. Midline sternal foramen: CT demonstration. J Comput Assist Tomogr 1985;9:489-90. Halvorsen TB, Anda SS, Naess AB, Levang OW. Fatal cardiac tamponade after acupuncture through congenital sternal foramen. Lancet 1995;345:1175.